Legal Talk Network was at the 2015 Winter Meeting for the Florida Bar in Orlando. This was the perfect time to sit down with Bar leaders and discuss what they’ve been working on, future conferences, member benefits, and online resources. 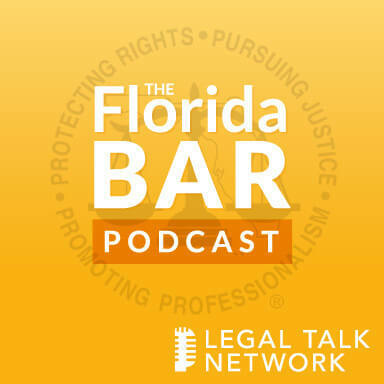 In this episode of The Florida Bar Podcast, Adriana Linares interviews Florida Bar President Greg Coleman about the Practice Resource Institute (PRI), member benefits focused on solo and small firms, and the Clio Cloud Conference happening during the Annual Florida Bar Convention in June 2015. Coleman discusses creating the PRI to fill the gap in technology resources provided to lawyers in small firms without tech departments. It is comprised of materials on PC and Apple computers, apps, practice-specific software, general practice software, practice management tools, and anything else a new lawyer, young lawyer, or a lawyer who wants to leave a firm needs to know. Several practice management products and other legal technology tools were vetted and are now provided as member benefits. Coleman and Linares discuss the Florida Bar’s day-long technology program, which will be presented on June 24th, just before the Annual Florida Bar Convention. Tune in for a preview of what will be included. Coleman closes the podcast with a discussion of the Florida Access to Civil Justice Commission, created by Chief Justice Jorge Labarga on Nov 24th, 2014. This commission addresses the issue of people who cannot afford or are unable to obtain legal aid. As a member of the commission, Coleman plans to engage the business community in order to think of creative solutions to the problem. Greg Coleman, partner at the Law Firm of Critton, Luttier & Coleman and President of The Florida Bar, has been practicing law in Palm Beach County for more than two decades. He joined the Law Firm of Critton, Luttier & Coleman in 1995 and was named partner in June of 2000. In June 2014, Coleman was sworn in as President of The Florida Bar. His focus is complex commercial litigation, insurance bad faith, employment litigation, professional malpractice defense, personal injury, and wrongful death. Florida Bar President Gregory Coleman and Adriana Linares record the next monthly episode live from the conference. Advertiser: Welcome to the official Florida Bar Podcast. Where we cover practice management, leadership, and what’s happening in Florida law. Brought to you by the Florida Bar Practice Resource Institute. You’re listening to Legal Talk Network. Adriana Linares: Hello and welcome to the official Florida Bar Podcast brought to you by the Practice Resource Institute on Legal Talk Network. The Practice Resource Institute is a new section of the Bar’s website designed to help Florida lawyers with law office operations and to assist members’ use of technology. You can get to it today at FloridaBar.org/PRI. I’m very excited to have President Coleman with me today. Good morning, President Coleman. Greg Coleman: Good morning, Adriana, how are you? Adriana Linares: I’m doing great. Thanks for taking a few minutes out of your busy schedule to come talk to us. Greg Coleman: Absolutely, my pleasure. Adriana Linares: I’m going to ask you a couple of questions, specifically about PRI, because that was your baby. Greg Coleman: That was my baby. Adriana Linares: I love it, tell us more. Greg Coleman: Before I became president, I recognized that there was a gap in the services the Bar was provided to its members, specifically in the area of technology. So if you went to our old mama’s page, which was the law office practice management that had been in existence for 30 years, and the folks were very diligent and worked very hard; but they had not kept up with the fast-moving technology that was occurring both outside and inside the practice. So we wanted to create one area on our website, where a new lawyer or young lawyer or lawyer that wants to leave a firm could literally have a one-stop shop and learn everything they need to know about the technology they need to start a practice; whether it’s PC or Apple, apps, software specific for practice, software for general practice, practice management tools, and we provide YouTube videos that give them instruction on how to create a trust account, maintain a trust account, how not to get a Bar complaint filed against you. Just a really neat compilation of really relevant materials to help them in their practice. Adriana Linares: It’s a pretty mighty endeavor. And you had to put together a special committee. Adriana Linares: Tell us about it. Greg Coleman: So we picked a special committee, a group of both tech-savvy individuals, lawyers – some non-lawyers like yourself, and also some lawyers that were not tech-savvy, so that we could get their view of how they would need to be fed information in order to learn because some of the tech websites, quite frankly, when you go there, they’re overwhelming if you’re not a tech person. So it gets scary and it intimidates them, which drives them away. So we wanted to take this committee, have them put this information together, and provide it to our members and we did it in a very short period of time; we literally did it in less than a year. Adriana Linares: We did; and it’s a growing site, it’s in its infancy, and the information that’s going to go on there will continue to grow. Greg Coleman: Yes, absolutely, the whole purpose of this website – as it’s launched right now – is to provide a platform. And that platform will grow as technology grows and technology changes and products arrive that have not even been thought about as you and I sit here today. So our members can just go to that one site, whenever they feel like it, and see these new products, try them out, test them, get recommendations on them, and we anticipate it’s going to be something that will last forever. Adriana Linares: Right, and it has to; otherwise, it can’t be stagnant. That was a big deal, so you’ve been a busy, busy president. So PRI was born, which is great, and it’s going to grow and there’s a lot that’s going on. You also decided that it was important to bring in some new member benefits because it was an area where we lacked in that department. Tell us about that. Greg Coleman: So we had literally no technology member benefits. Adriana Linares: Broke my heart. Greg Coleman: I know, and if you want car insurance, we have like 6 car insurance companies you can go to. But if you want a practice management program or platform for your firm, there is nothing that is recommended on our website until now. And what we did was very quickly, – with your help, thank you Adriana – vetted and interviewed a number of different products. And we went through the Member Benefits Committee, as we should, and they vetted all of these folks and we got some great member benefits for our members. And specifically, the members out there, of our hundred thousand lawyers that practice in law firm, so 5 lawyers or less, which constitute 59% of our members. That is our target market for these products. Because the lawyers that work at the big firms, they have technology that floors; and if they have a PC problems, some person scurries up, replaces the PC and leaves. So we’re trying to help our solo practitioners in our small firms. Adriana Linares: Yeah, I think that’s great. And right now during the recording of this episode, we’re still working out all the contracts and making sure it’s as good as it could be for our members. So those are going to be announced and coming out in the next few weeks and it’s really excited. I think we ended up with about ten, for now, and we also hope that that grows as more viable benefits and technology and practice management vendors come our way. Greg Coleman: Oh, absolutely, I mean, some of these member benefits that we’re rolling out right now may be obsolete in a year. Adriana Linares: Yeah, let’s hope not. Greg Coleman: There may be a better mousetrap. And so we’ll have to keep looking at them while we move along to make sure that we have the right products for our members. Adriana Linares: That’s great. Okay, so we’ve got PRI, we’ve got tech benefits, which is new and awesome, and then you were very open and agreeable to bringing a whole new concept and idea as far as technology conferences. Now, what we don’t want to do is sweep under the rug what the general practice solo small firm section has been doing with their annual conference at Midyear, which happened by the time this is recorded in January. But what are you bringing to us for the June meeting? Greg Coleman: By the way, the general practice and solo section does a great job at this, it’s called the Wild, Wild Tech, and it’s getting new and novel technology to our members and it’s done at the Midyear Meeting. They do a wonderful job and we’re very proud of them. Adriana Linares: Yeah, we want to remind everybody to put that on their calendars for next year’s Midyear. Every Midyear, or winter meeting, general practice solo small firm puts on a technology conference. Greg Coleman: It’s always in January. Adriana Linares: So there’s at least two now that the Bar’s doing, because? Greg Coleman: The next one is a little bit different. So technology is changing the way we practice, and a lot of that deals with external influences. Apps that are being created by non-lawyers, that are owed by non-lawyers, that are kind of invading the independent third branch of government, which is the court. So we have put together a group of some of the most world-renowned experts in legal technology and more importantly, the future of technology and the future of the practice of law as it’s affected by technology. And for the first time ever, we’re having a program at our annual meeting, which is the last week of June of this year 2015, and we’re doing it on a Wednesday; and we usually start all of our meetings on Thursdays. I’m hoping that our Bar members will get really excited about this and come visit this on Wednesday. We’re going to stream it live, of course, over the web, but we want a lot of people there in person. I don’t think the average lawyer realizes or recognizes where our practice is going, and that these external issues aren’t going away. Greg Coleman: So I’m really excited. Adriana, you’ve been critical in putting together this program, and you’re very excited about it, as am I. We have legal futurists that are coming to talk to us that talk about their vision for the future of the practice of law. Adriana Linares: A lot of cloud computing. Greg Coleman: A lot of cloud computer, a lot of really neat products that I think a lot of our members don’t really much know about, and quite frankly, scare them. So we’re excited and I would encourage everybody to put that on their calendar for Wednesday of the annual meeting in Boca Raton. Adriana Linares: Right, and more details to follow as that gets a little bit phynaster; there’s going to be some big announcements about that and we’re pretty excited about it. Greg Coleman: We’re very excited about it. Adriana Linares: So you’ve come a long way from when I first met you, and before you were president – even maybe president elect, I can’t remember now. Yeah, when we first met, you weren’t even president elect. Greg Coleman: I was president elect designate. My president electorate introduced me to you. Greg Coleman: So I think the single most important focus for us as a Bar association, or a Bar, that operates under the Supreme Court, is both recognizing both the opportunities and the threats of these outside influences on the practices of law, and there are great opportunities. But at the same time, if non-lawyer-owned entities start invading our marketplace, then we have a problem because that’s not the way we’re structured. We’re an independent branch and we are supposed to be free from outside influence. So we need to be very, very careful as we go down this trail of improving lawyers’ lives and ultimately our citizens through more efficient practice of law to make sure that these outside influences don’t affect the independence of the branch. That is the dance that is difficult. Adriana Linares: Right. That is and you’ve become quite an expert on that. Greg Coleman: I don’t know about that, I just read a lot, a lot of the materials you give me, I read a lot on my own. Adriana Linares: It makes sense, we can’t ignore it. Adriana Linares: And we can either become a part of it, which is why all these things that you’ve been doing are so exciting, so interesting; I think you’re leading the way Greg, it’s pretty awesome. Greg Coleman: Well I appreciate that and I always use this analogy and I love it. I envision this giant conference room somewhere in Michigan: The Acme Fax Company. With about ten people sitting around a table saying, “We need to come up with a better marketing tool to sell these faxes, because people aren’t buying them like they used to; we need to come up with a new image for them.” Well guess what – no matter what they do, faxes are gone. They’re dead. They’re never going to be used again, something has replaced it. So we need to understand that; we can’t get stuck with, like, the fax machine and say, “I’m using the fax machine I don’t care what the rest of the world is doing.” We have to change for the world. And we, by nature, lawyers by nature, need people like you. Greg Coleman: That are creative, that are innovative, because we’re trained to look backwards and we’re very slow to move forward. And we have to change that dynamic. The leadership of the Bar, the Bar itself, and the practicing lawyers need to learn to look more forward in terms of what they’re going to do with their practice. Adriana Linares: It’s just so important it’s unbelievably. Before we move onto our next segment, we’re going to take a quick break to hear a message from our sponsors. Adriana Linares: Welcome back to the official Florida Bar Podcast. I’m Adriana Linares and with me today, is President Greg Coleman. Before the break, we talked quickly about PRI, new member benefits, and the cloud conference that’s coming up. Before I let you go I’m going to ask you about one more big thing that you’ve done. Because, as if everything I just rattled off wasn’t enough, your access to Justice Commission. Do you want to talk about that for a minute? Because I know you’re very proud about that. Greg Coleman: We are very, very proud of the Supreme Court-created Access to Civil Justice Commission and it was created by Chief Justice Labarga on November 24th. We had our first meeting last Friday. The commission is designed to look at a problem in our society and it is a societal problem where only 20% of the indigents – the folks that qualify for legal aid, are having their legal needs met. And more importantly, or as important, 60% of our society are the working middle class. And they’re the folks that make $40-50,000 a year; blue-collar workers, they live with a family of four, and they live paycheck to paycheck. So if they have to get divorced, and they have all of these family law issues, they can’t afford a lawyer at $25 an hour. So we have put this commission together to look at this issue and study this issue and there are 32 commissions around the world that are looking at this, but we’re different. Why are we different, you may ask. Adriana Linares: I was just going to ask you that! How did you know? Greg Coleman: We’re different because we’ve engaged business community. We have the chairman of the board and CEO of Cheney Brothers, which is one of the largest, independently-owned food distributorships in the country. We have the senior vice president general counsel of Disney. The senior vice-president general counsel of Publix, and a number of other really recognized business leaders. And these folks two things. Number one, they think outside of the box, and they think of creative solutions. The analogy I always use in my Bar speech is using a shooting analogy. Lawyers tend to, by nature, say, “Ready? Aim… aim… aim… aim…” and we never fire, because we need a perfect shot. If we get anything less than 95%, we’re disappointed. Business people say, “Ready? Fire. Aim.” And that’s because they want to get the bullet moving. If it’s going in the wrong direction, they fire another one. If that’s going in the wrong direction, they fire another one. We need that mindset at the table to help us and we need to educate them about this societal problem and come up with societal issues. Because the grocery stores don’t solve world hunger. The builders don’t solve homelessness and lawyers have been doing more than their part for centuries, donating millions of hours in Florida a year of free legal time and it’s just putting a debt in the problem. So we’re very, very happy, we’re very, very proud, and we’re very, very excited about this. Adriana Linares: What’s interesting is you’ve brought together a multidisciplinary panel. Which is a hot topic these days too, with everything that’s going on as far as the way technology is infiltrating and enhancing the practice. Well, it looks like we’ve reached the end of our program. Greg, if people want to keep an eye on what you’re doing for the rest of your presidentialness and after, how can they either get ahold of you or keep an eye on you through the Florida Bar website? Greg Coleman: Well certainly, the Florida Bar website is the number one place. We talk about everything that’s current and everything that’s been going on. You can read the Florida Bar News online, you can look at our Florida Bar journal online, you can look at everyday what we’re doing online, you can go to the Practice Resource Institute online. You can go to our Facebook page, which also tracks a lot of what we’re doing and where we are and who we’re talking to and about what, and you can stay engaged that way. We’re excited because we’re getting more and more people that are following us that way. Adriana Linares: And Greg, you and I have been friends for a long time now, and I really want to take this moment to thank you so much for being so open and so willing to help the members. I’ve been out there a long time, seeing what’s happening and really wanting to help, but without leaders like you and being open to these new ideas – some of which, I know, are crazy, and they look at you sometimes and think, I can’t believe he’s even going to consider that. That takes a really big man and I really, really appreciate it and I’m sure all the members do too, thank you so much. Greg Coleman: Thank you Adriana, I’m humbled by this position and I’ve learned so much in terms of dealing with these very, very pressing and important issues. And thanks to you, you’ve been a guiding light for us, and I appreciate your continued help, we’re going to need it. Adriana Linares: Thank you so much. Thank you very much, for all you listeners who’d like more information about what you’ve heard today, make sure you visit the official Florida Bar Podcast on the PRI section of the Florida Bar website. This brings us to the end of this show; I’m Adriana Linares, thank you for listening. Make sure you join us for another great episode of the official Florida bar Podcast. Advertiser: The views expressed by the participants of the program are their own, and do not represent the views of, nor are they endorsed by, Legal Talk Network, it’s officers, directors, employees, agents, representatives, shareholders, and subsidiaries. None of the content should be considered legal advice. As always, consult a lawyer. Thanks for listening to the official Florida Bar Podcast, brought to you by the Florida Bar Practice Resource Institute and produced by the broadcast professionals at Legal Talk Network. Join host, Adriana Linares, for her next podcast on practice management, leadership, and what’s happening in Florida Law. Subscribe to the RSS feed on LegalTalkNetwork.com, or in iTunes. The official podcast of the State Bar of Florida. Rebecca Bandy and Adriannette Williams talk about how the Florida Bar is seeking to elevate professionalism amongst its lawyers. Michael Cohen talks about the critical things attorneys need to know when hiring, evaluating, or terminating an employee. Missy Gavagni and Scott Baena talk about the roles of the Florida Board of Bar Examiners. Al Saikali talks about how lawyers should prepare their firms for different types of cybersecurity threats. Adria Quintela talks about The Florida Bar’s Department of Lawyer Regulation and attorney discipline.